Ahoy there me hearties! how about a meal out with a difference as the winter draws in? 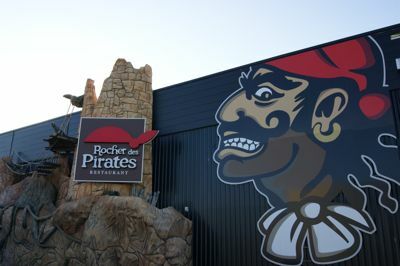 Rocher des Pirates is a unique dining experience in a pirate-themed restaurant, and they don’t do themed by halves! I would say that this one is for the families amongst you, except that on every occasion that we have eaten here, we have been astonished to see a wide range of diners from young couples on dates to groups of 30-somethings and even retired couples getting in touch with their inner pirates! The marketing manager said these “big kids” are not an atypical cross section of diners, although the restaurant was originally conceived as somewhere exciting for children and families to eat. Entering Rocher des Pirates is like being transported into a whole new world. 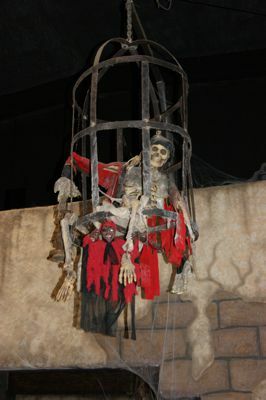 skeletons hanging from the ceiling, bawdy wenches and, when we visited at Halloween, all manner of ghosts and ghouls. For young eyes, it is a magical site which provokes some wonderful reactions. If pirate décor, pirate waiters, pirate food and a soft play area aren’t enough to tempt you, on Tuesday and weekend evenings and weekend lunchtimes the waiters also put on a 15 minute show of swashbuckling and silliness. A custom-made platform acts as a stage and zip lines over diners’ heads make for a dramatic and entertaining diversion while you finish off your meal. The show changes four times a year. The pirate theme is carried through to the menu with dishes such as La Jamb’ de bois (wooden leg) or Parillade de Filibustiers (Buccaneer’s Grill). The food on offer is a cross between your typical French brasserie (steaks, seafood) and an American diner (pizzas, burgers). There is certainly plenty of choice. Prices are fairly standard and given all the extras here, I’d say they are fair. Pizzas start at €7.90, mains at €13.90 and starters at €7.90. Let’s face it, you don’t really come to somewhere like this for the gourmet cuisine but the food surprised us in a good way – it was fresh, well presented and tasty. The child’s menu is €6.80 with a choice of burger and chips, spaghetti bolognaise or pizza and an ice cream tub for dessert. Drinks are extra – I was told that a free “cocktail” was offered to those in costume but my little four year old pirate was not given one. I went for the Harrr!!! burger and it exceeded expectations – good quality meat, a nice bun and tasty fillings. Mark went for a pizza – it was heavily laden with toppings and in fact he couldn’t finish it – a testament to the generosity of the chef as this is a rare occurrence! In addition to the à la carte menu, on weekday lunchtimes outside of school holidays there is a two course menu for €9.80 with two choices for each course. Rocher des Pirates is proving a big hit – they don’t take reservations and they rely largely on word of mouth to keep the punters flooding in. Initially, getting the finance together for this venture was a struggle. Famously averse to risk, the French banks laughed at what they perceived to be a crazy scheme to launch a themed restaurant in an undeveloped commercial zone near Perpignan. Persistence paid off though, and the restaurant opened its doors in June 2007. The former cabaret owner whose brainchild it is has had the last yo ho ho! He is currently rolling out what promises to be an extremely successful franchise. Marketing manager, Thomas Trainini explained to me that the Perpignan restaurant has acted as a “laboratory”. Based on their findings there, the owners reworked the concept and the logo, and have launched a flagship restaurant in Toulouse as a showcase for potential franchisees. This is a whopping 2000m² with 600 covers and has served an astonishing 500,000 covers in 6 months. Shiver me timbers!